We all know that there are bits and bytes in computing. However, what are these units of measurement – and how do they make the computer work? Data is stored in memory as a number of 0s and 1s. Each of these is called a bit (Binary digit), so for example the number 0110 is a 4 bit binary number. 8 bits is called one byte. This is the unit of memory that is used to store one character. A byte can store eight 0’s or 1’s in 256 different combinations. Letters are stored as binary numbers using the ASCII code. ASCII means American Standard Code for Information Interchange. Most computers use this code so that they can communicate with each other. Each ASCII character takes up one byte. For example 01100001 represent the letter `a`. In order to store the word `computer`, you would need 8 bytes of storage. One kilobyte or KB is =1,000 bytes, one Megabyte or MB is= 1000,000 bytes and one Gigabyte or GB is= 1,000,000,000bytes. 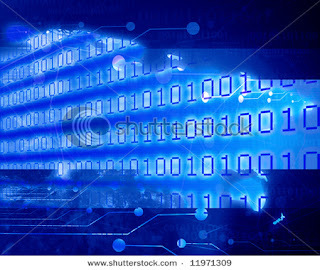 Remember – Since computers can only store binary numbers, all computer data has to be in this digital format. Images, sounds and video - all have to be digitized before they can be processed by a computer.